Our time in Whitefish, MT came to an end. The last few days there, we had been busy trying to plan our next move. After studying many forecast models the snow report for the Powder Highway was dismal. They received a foot of fresh snow, followed by an intense warm-up with rain in the forecast. Franticly searching for the goods, we looked further south. Wyoming and Montana conditions didn’t seem to be any better. The entire western part of North America was having one of the worst weeks of snowfall on record. We realized if this truly was going to be the “Trip of a Lifetime,” we needed help. It was time to contact the experts. Local Freshies reached out to the crew at Open Snow. After a few emails back and forth we were headed to Lake Louise. The thought was, due to Lake Louise’s eastern location in the Rocky Mountains and high-base elevation it provided the best chance to find good snow. Originally, Lake Louise wasn’t part of the plan but this was an adventure! We loaded up the gear and pointed the truck towards the Canadian border. Once across, we continued north. The snow seemed to get worse. Temperatures hovered in the mid-40’s. 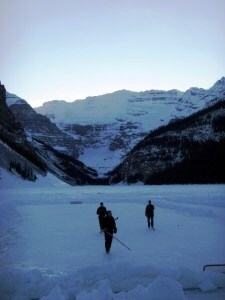 We began to doubt whether Lake Louise would be any better. Even though the weather was being fickle, we made the best of our travels. The scenery was amazing! We were treated to picturesque views the whole way. The Kootenay Range was genuinely beautiful. The journey continued down the desolate road. This was obviously a remote part of the world. Other vehicles were scarce. The time between passings was considerable. Warning signs on the side of the highway stated the distance to the next gas station. Driving all day, we finally approached the town of Radium Springs as the sun set. It was perfect timing. 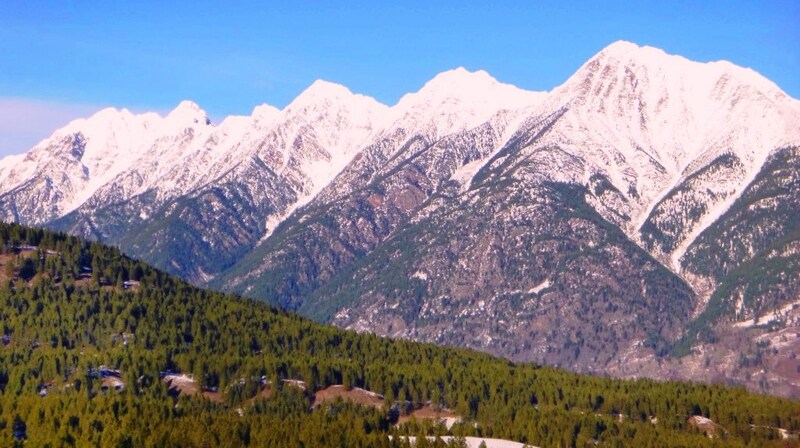 We were provided a spectacular view of the majestic peaks in the Canadian Rockies. As dusk turned to darkness, we rolled in to Banff National Park. The walls of snow on the side of the road began to grow. Completely dark now, the mountains in Banff National Park provided the boundaries on the side of the road to guide us to our final destination. Turning into the Deer Lodge parking lot, it seemed that Lake Louise was saved. The major snow melt in Western Canada didn’t make it this far East. Large walls of snow and cold air confirmed we had made a good decision. Entering the Deer Lodge was like being transported back in time. 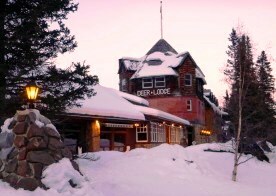 The hotel is one of the oldest structures in the Lake Louise area. Built in the 1920’s, it has an air of a hunting lodge that the noblemen from the United Kingdom would have visited when touring the park. Large dark colored timbers decorated with animals gave it a true rustic feel. It was very late. We were starving. It was time for dinner! Shocking, is the only way to describe this menu! We really didn’t expect to see such high level cuisine in such a remote location. Perusing through the menu, the choices were out of this world. 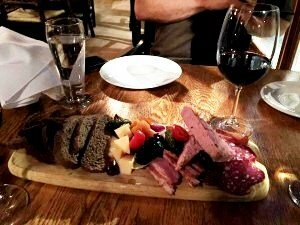 As an appetizer platter we went with air dried bison, wild game pate, elk salami, and smoked pepper duck!!! Next, the main course….wild caribou! In my opinion Caribou is the best meat, hands down. There is a perfect balance of flavor like a juicy beef steak, but it finishes with a tinge of wildness. It’s true, Caribou are endangered. This being the case and Local Freshies being good stewards of the Earth, we made sure our meal was farm raised. No wild animals were harmed. It was a unique dining experience. Once our bellies were full it was time to get a room to rest for the adventure ahead. Rooms were nice and cozy. As a side note, there are no televisions. It is definitely a great place to unplug from the digital world. We unpacked and hit the bed. As we dozed off, thoughts of enjoying nature, solitude and a bit of history lingered in our minds. Stay tuned…we explore Banff and take a dip in the famous hot springs. There might even be snow in the forecast!